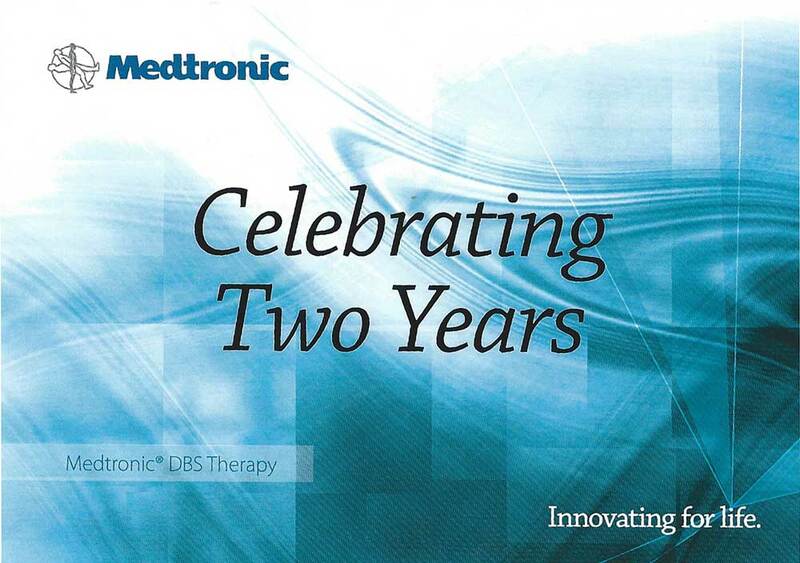 This week I received a card from Medtronic celebrating two years since I received Deep Brain Stimulation (DBS) therapy. Medtronic is the company that made my DBS equipment including an implanted pulse generator, the lead, and the extension. A battery-powered neurostimulator encased in a titanium housing sends electrical pulses to the brain to interfere with neural activity that results in tremor. The pulses run through a lead: wire insulated in polyurethane with four platinum iridium electrodes placed in one or two different parts of the brain. The lead is connected to the neurostimulator by the extension, a wire that runs below the skin, from the head, down the side of the neck, behind the ear to the neurostimulator, which is placed under the skin in the chest. The combination of this equipment makes my life wonderful thanks to small electric shocks that halt my tremor full-stop. I am one of the fortunate patients who does not take medications to supplement the DBS and I did not experience side-effects due to surgery. DBS has given me a deep appreciation of the quality of life and a sense of gratitude that I’m able to live life to the fullest. Every couple of weeks, I check the reading on my Activa® SC neurostimulator, and note the gradual decline in its life of 3 to 5 years. In the next couple of years or so the neurostimulator will need to be replaced. Replacement of the neurostimulator requires a surgical procedure in the chest, but at least the surgery is not in the brain. It is a small price to pay for the gift I’ve received. The past two years have been awe-inspiring due to my DBS equipment. My heart-felt thanks go out to Medtronic for remembering my anniversary and innovating for life. Happy 2nd rebirth my dear Darcy! Can I share on FB?